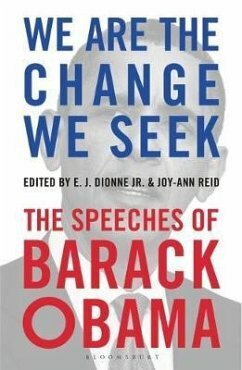 'We have been given the first partial, though still substantive, look at Obama's words, and it is a political partisan's dream to see them so finely gathered here' Washington Post We Are the Change We Seek is a collection of Barack Obama's greatest addresses, beginning with his 2002 speech opposing the Iraq War and closing with his emotional farewell address in Chicago in January 2017. As president, Obama's words had the power to move the country, and often the world, as few presidents before him. Whether acting as Commander in Chief or Consoler in Chief, Obama's unique rhetorical style could simultaneously speak to the national mood and change the course of public events. Obama's enduring eloquence, both written and spoken, propelled him to international prominence and ultimately made it possible for the son of a Kenyan man and a white woman from Kansas to become the first black president of the United States.